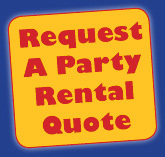 Fun rentals for your next residential party, church, school or camp event. For the cooler month's, rent some of our HOT slides and combos. The non-stop bouncing, climbing and sliding keeps the kids energy up and the parent's worries down. Super Combo, C4 Combo, 5 in 1 Castle Combo, 18ft Slide, Volcando & Fire, etc. (Valid Monday thru Friday from Aug 17 - Sep 1, 2017) . *Concession Supplies extra. $15 Not to be combined with any other offer or discount. Like us on Facebook and get $5 off any rental of at least $100. 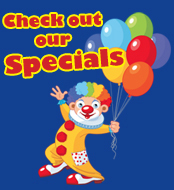 Want more than inflatable jumps and moonbounce rentals?